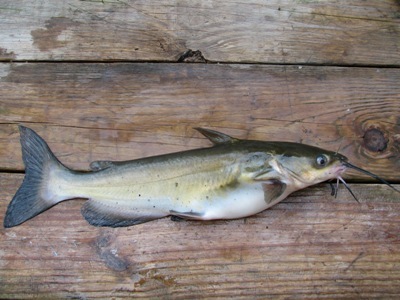 The channel catfish, Ictalurus punctatus, is North America’s most widespread and abundant species of catfish. Channel catfish are easily distinguished from all others, except blue catfish, by their deeply forked tail fin. They are olive-brown to slate-blue on the back and sides, shading to silvery-white on the belly. Channel cats typically weight 2-4 lbs, occasionally reaching weights of 40 pounds or more. They are popular as food fish, yielding firm white fillets. Channel catfish are native to North America east of the Rockies from southern Canada, southward into Mexico, and along some parts of the eastern seaboard. The species has been widely introduced in other areas as far west as California.